When we last checked in with Phred the Viet Cong terrorist, we saw how, after B.D.’s time in Vietnam, Garry Trudeau used Phred’s experience of the war to comment on some of the conflict’s most horrific dimensions, notably the slaughter of civilians from the relative safety of thirty thousand feet. We also have seen how Phred acted on his anger and sorrow by bringing Cambodian refugees to Washington to testify to the Senate about the “secret bombings” that had destroyed their homes and livelihoods. And yet, as Phred was a mouthpiece for the millions of people in southeast Asia who died or were wounded and displaced by a long, senseless war, he also, after so much time witnessing and perpetuating horror, lost much of his passion and became less and less committed to the ideological foundations of his peoples’ struggle and more and more likely to treat the war as a workaday gig. But the war is never far away, and Phred’s souvenir stand is destroyed during a firefight that disrupts the cease-fire. Phred’s rage at the soldiers who are responsible for ruining his livelihood reveals how he is weary of the violence that his defined his entire life, and his disenchantment would shape much of his approach to his job as he was inevitably dragged back into the field. A few months after opening his shop, Phred received the telegram that young American men had been dreading for years: “Greetings.” While Phred accepts his obligation to rejoin the Vietnamese people’s struggle, his heart is no longer in it: when a peasant reminds Phred that he is fighting because “the true Vietnamese people’s government is responding to the aggression of the running dogs,” he is momentarily taken aback by the revolutionary dogma, forgetting that “we talked like that.” After the failure of the cease-fire, Phred would see the struggle to liberate south-east Asia as more of a gig, and less as a deeply-held commitment to an ideological cause. To reflect this change in Phred’s outlook, GBT re-purposed a trope that had been a central element of the early Doonesbury strips: writing about real-life events through the language and lens of sports commentary. Even without the hundreds of strips set in a football huddle, sports has always been part of Doonesbury’s DNA. 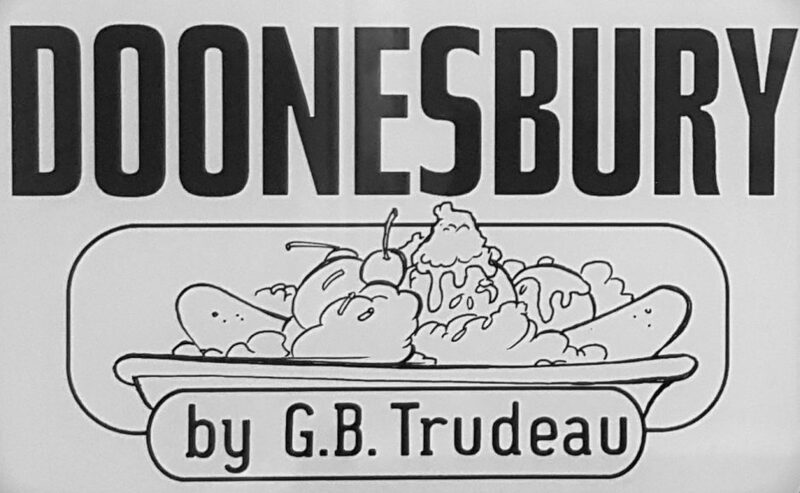 The historian Gary Wills, in his introduction to The Doonesbury Chronicles, the first hardcover compilation of the strip, discusses how, by having characters comment on their actions in the style of a play-by-play announcer, Trudeau “opens up a space in which [their] personality can grow.” Similarly, Trudeau’s use of themes drawn from the world of professional sport in Phred’s story gives readers a glimpse into how Phred’s motivation for fighting was shifting from ideological commitment to personal advancement. As Phred was being pulled back into the war, the world of professional sports was in the earliest stages of a critical change which saw athletes begin to demand a more equitable slice of their sports’ revenue pies. In 1971, Bobby Orr signed the first million-dollar contract in National Hockey League history; a year later, Bobby Hull inked a deal worth nearly three times that much for the rival World Hockey Association. It’s all part of the game. Doonesbury, 17 May 1973. Awesome news for Phred. Doonesbury, 26 May 1975. Phred’s war was over, but he would continue to play an important part in Doonesbury, providing GBT with a voice with which to comment on the politics of post-reunification communist Vietnam, the Third World at the United Nations, and the ultimate triumph of American capitalism over Vietnamese communism. But his most important role was that of being a simple human being immersed in a deeply horrible situation. ‹ PreviousDoonesbury Goes to War, Part IV: Phred, B.D. and the Heartless Air Pirates.